When the Samsung Omnia made its first appearance last year, it was just before the iPhone 3G came along and revolutionised the lives of many. Many thought it’d be a good 3G contender, but within weeks of hands-on experiences and reviews, followed by the hotly anticipated iPhone 3G debut, it was soon realised the Omnia didn’t quite make the cut. But iPhone 3G competitiveness aside, it was a great phone. So following a return to the drawing board, Samsung got its thinking cap on and have returned with the Omnia HD. It’ll be no surprise then, that it’s aimed at people with a need for connecting to HD content on the move. This includes both shooting HD video and watching HD content on your HDTV via DNLA connectivity. Samsung is claiming a world’s first by being able to capture 720p HD video at 24fps, equipping you with the ability to shoot and upload HD content and capture high quality pictures on its 8 megapixel camera. 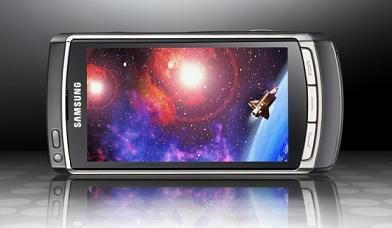 But world first’s aside, the Omnia HD is Samsung’s first full-touch Symbian handset – that’s 3.7-inches of touchscreen HD goodness. The camera sports all the usual camera capabilities such as face detection and smile shot, but only packs an LED flash. And connectivity-wise you’re looking at HSDPA, WiFi, GPS and up to 16GB of internal storage, or 32GB with a microSDHC card. It’ll be available from the second quarter of the year but Samsung is keeping tight lipped about costs. Competition winners announced – the chance to win an Element iPhone case has ended!